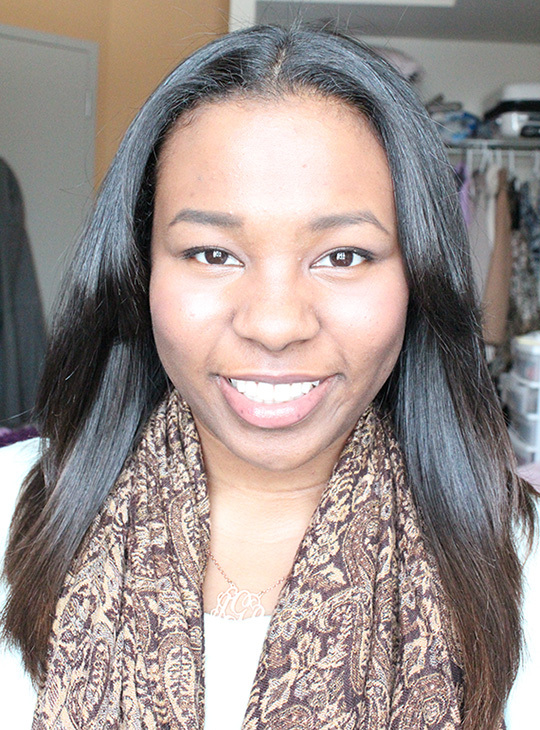 Straight Hair: A Nice Change – amandarobots. Well, it didn’t just happen. If only it were that easy! I spent most of yesterday (about 2 hours to blowdry, half an hour to flat iron) straightening my hair. I hadn’t straightened it in maybe four months, mostly because it was getting longer and becoming too much work. In the past I wore it in a bob because it was way easier to straighten, but I’ve recently embraced the curls because I want my hair long again and it’s just too much work. But for whatever reason, I felt like straightening it! My process was a long one. First I washed with a clarifying shampoo – Lush’s I Love Juicy, which smells like a mixture of red and purple Tootsie Pops to me. Then I conditioned and detangled with conditioner in. Out of the shower, I tied my hair up in a towel for about 20 minutes to let it partially dry. Then I took the diffuser off my blowdryer and replaced it with the direct airflow nozzle thingie. I used some heat protectant in my hair to make sure that the damage wouldn’t be too serious, bust out my roundbrush, and got to blowdrying. While blowdrying, I watched two episodes of Being Erica on Netflix. Then I grabbed my flat iron, which is also a T3. I didn’t have to iron much, because I’m quite good at getting the hair mostly straight. The ironing is just good for depoofing. Throughout the whole process, I was especially careful with my ends, because – as you can still kind of see in the photo – I ombréd them back in the Fall and the bleach has made them quite fragile. This is the first time I’ve straightened my hair since dying it and since getting it cut while curly. The last time my hair was straight, I had full bangs in the front and it was just above my shoulders! It’s quite the change. My bangs now graze my cheeks, which is nice. The best part of straightening curly hair is seeing how long it actually is! I’m not sure whether I’ll straighten it again or leave it curly next time, but it’s a pretty cool way to mix things up.